The arrival of the cold season does not necessarily mean that you cannot enjoy growing vegetables in your garden anymore. This article features some of the best winter gardening ideas that will ensure you benefit from fresh homegrown vegetables all year round. Keeping your food supply going through the winter is not as hard as most people imagine. This is because there are some types of vegetables out there that do very well in cold temperatures. However, you must sow these before the ground starts freezing over. The best time for this is early autumn, up until the end of October. More demanding species require a warmer environment. you can plant those in a greenhouse or indoors, for starters. Once they sprout, it is safe to move the baby plants outside a few weeks later. 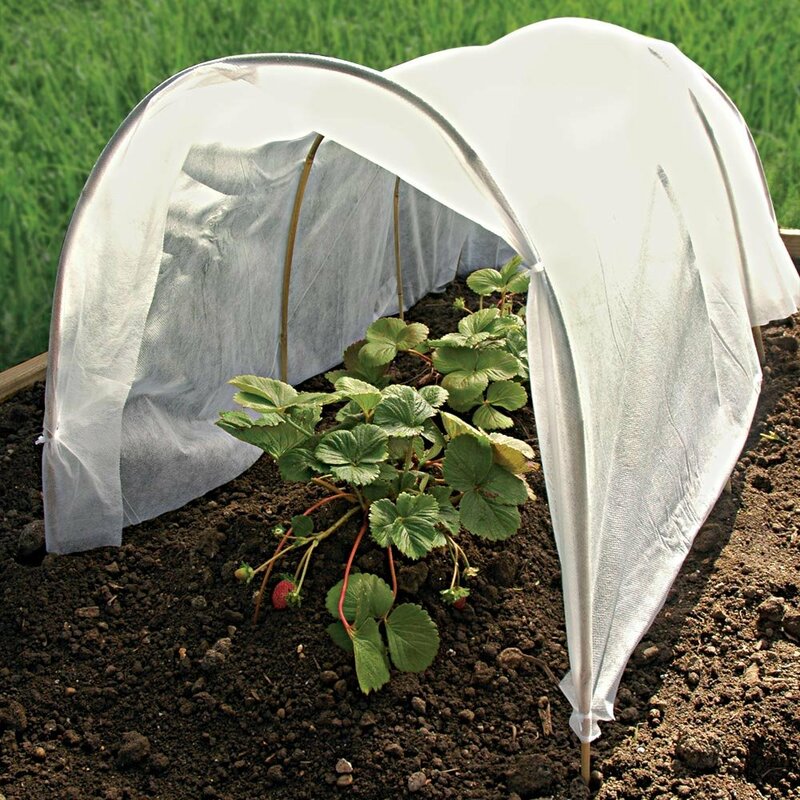 Ultimately, make sure to cover them with perforated polythene or fleece and watch out for pests. 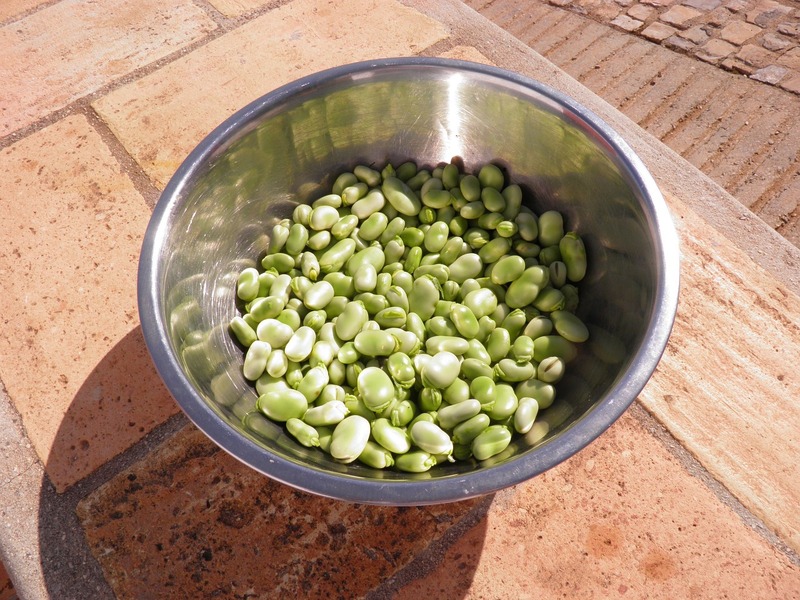 You can choose to start sowing broad beans in autumn and ensure a fresh supply for the winter to come. One of the main advantages to starting planting in autumn is that you benefit from a sturdy soil that keeps all the nutrients from leaching. Hence, they also develop a lot faster than those planted in April, for example. The best autumn varieties are Super Aquadulce and Aquadulce Claudia. If you plant these in an exposed position keep in mind that they will grow quite tall during winter. As a result, place a stick or a cane next to each plant to offer support. Also, another good idea is to pick out some tops before the pods get a chance to form. This will help to stagger your crop and delay pod production. Asparagus is also another great choice for planting in autumn. Most people find it tricky to deal with asparagus. However, as long as you remember the most important piece of advice when it comes to growing asparagus, you will have no problems growing it. Keep the ground bed weed-free before anything else. However, you still have to wait about two years before you can start cutting them and adding these delicious treats to your cuisine. 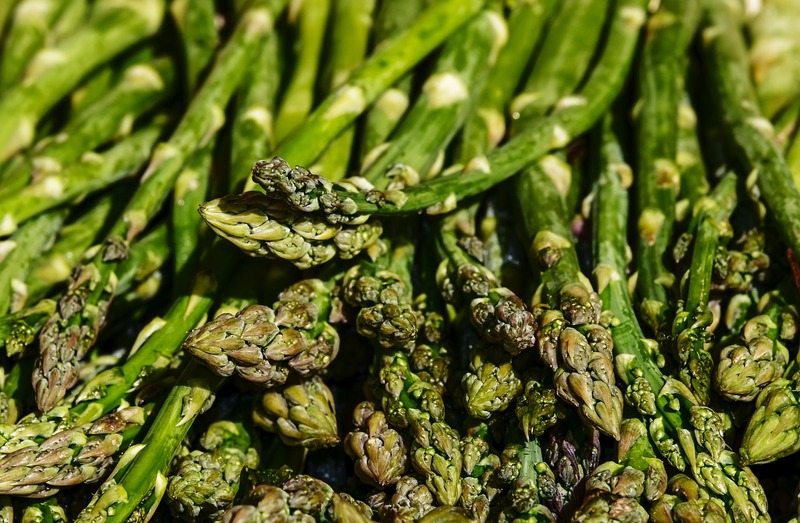 If you are a novice when it comes to planting and growing asparagus, you can learn from our previous article everything you need to know about a successful asparagus crop. Peas are a great choice and one of the best winter gardening ideas for late spring. You can either start growing baby plants or even sow them directly into the ground. If you’re going for the latter, bury them about one inch deep and another one apart from each other. Form thick rows by dividing them into groups of no more than three lines. Next, place each row 18 inches apart from each other. 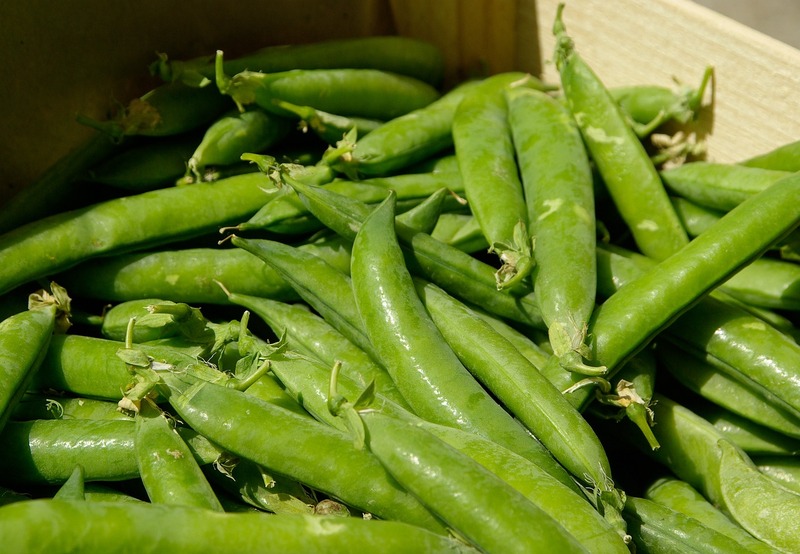 Peas overwinter exceptionally well, so you will be able to enjoy a fresh supply for the entire winter duration. One of the best peas varieties that has no problem growing in relatively low temperatures is the Meteor. Also, in order to speed up germination, you can place some seeds on a wet kitchen towel and proceed to sow them in modules after the roots start to develop. Planting garlic for the cold season is one of the best winter gardening ideas on our list. Also, it is easy to grow, delicious and carries a wide range of health benefits that will boost your immune system. As a consequence, you will also stay safe from catching a cold. Before you star planting the garlic bulbs, however, mix some potassium sulfate into the soil if the planting area suffered from rust. Also, any spray-based sulfur compound works just fine. Next, start planting the cloves individually. Bury them approximately 2.5 inches deep in light soil. IN heavy soil, you can plant it one inch below the surface. Ultimately, make sure that you leave approximately one foot of space between each plant in all directions. In order to properly fill your salad bowl, you will need some tasty lettuce. This choice is great for your garden because it is easy to grow, tasty and rich in nutrients. 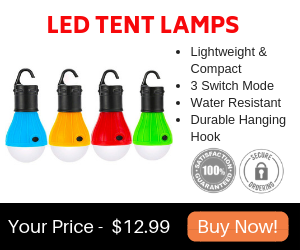 Also, it does not require high light levels and does very well in low temperatures. Hence, you can sow it up until the beginning of November outside and pick it until late December. Also, if you cover your crops with some fleece, you may still be picking it even in January, as well. If you are running short on space, you can plant lambs lettuce in between spring cabbage plants. The best piece of advice is to start growing everything inside either we are talking about a greenhouse or near sunny windows with supplemental fluorescent lights. 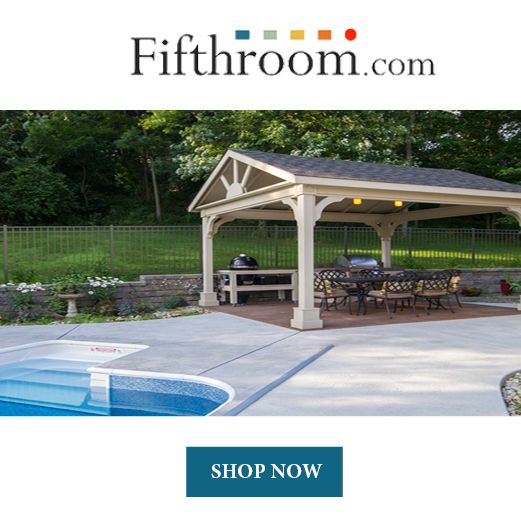 Put some space aside in your basement for your winter garden, if possible. If not, use a greenhouse. 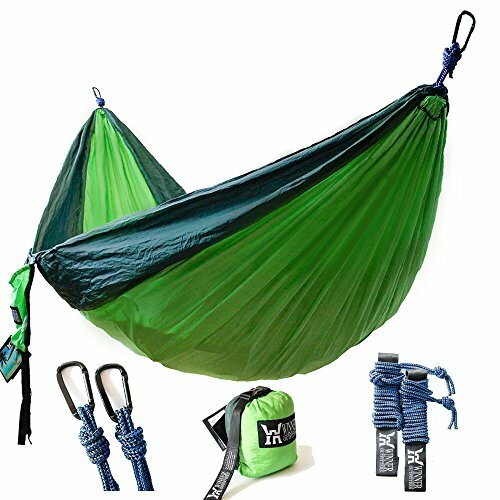 These particular projects are easy to make and will benefit you a great deal in the long run. Also, they do not require heating. Just use some frost blankets to make sure your plants do not freeze over in low temperatures, below the freezing point. Furthermore, use some plant tonic to help them grow faster and easier. Spread horse manure over the garden beds in late autumn to provide the soil with a wide range of nutrients crucial for a rich harvest. Also, make sure the plants benefit from the right moisture levels and vented air in warmer days in order to avoid heat damage. Furthermore, if you also grow chickens, keep them out of the garden. They can get under the coverings and easily destroy your crops! Planning ahead and preparing for the winter accordingly, makes the difference between successful rich crops and failed ones. Hence, a first important step is to start seeding every other two weeks in early fall in order to find out what timing works best. You can also do this in late winter if a crop fails, when days start to get longer again. Keep in mind that many fail due to low light rather than cold temperatures. Start growing your food supply inside. Once the plants sprout, you can move them outside after a few weeks. However, it is too cold in winter to manage without proper cover. 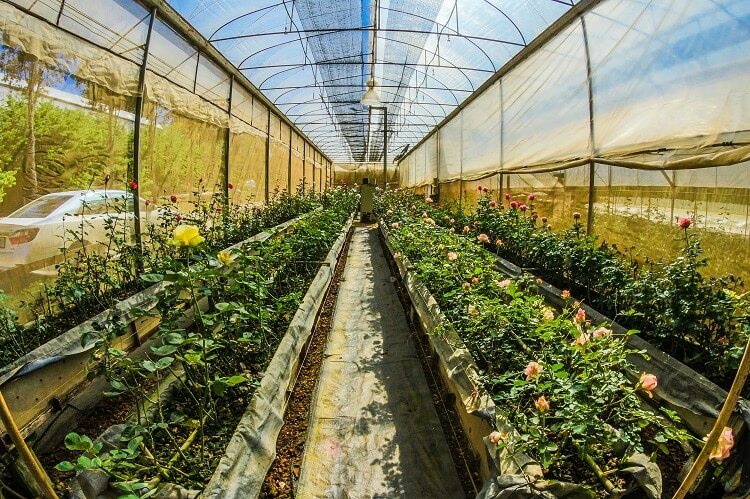 Hence, you can move them in a greenhouse or start building a high tunnel. If you go for the latter, make sure to remove heavy snow on top of the covers so it does not crush the plants. Ultimately, pay close attention to the weather forecast and do your best to keep your winter collection safe from inclement weather. Also, try to spend as much time in your garden when the cold season settles in as you would do in summer. 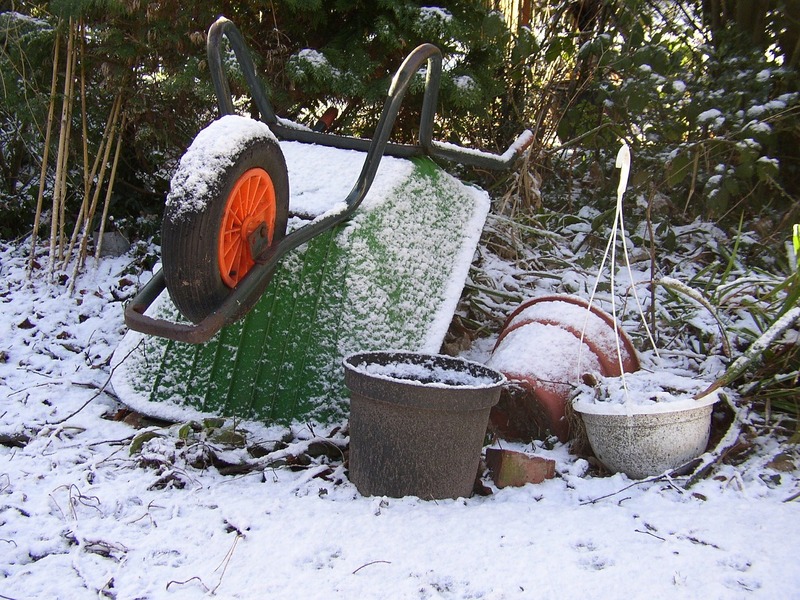 There are many winter gardening ideas you can use from this article in order to keep your plants safe from low temperatures in terms of proper cover. A great first idea is to start your food supply in raised beds because they retain heat and make for a nice and cozy environment in which your plants can grow during winter. Cover them with a Reemay garden blanket in order to keep the plants from freezing over. Mulch and hay make for great covers for the garden beds during winter. 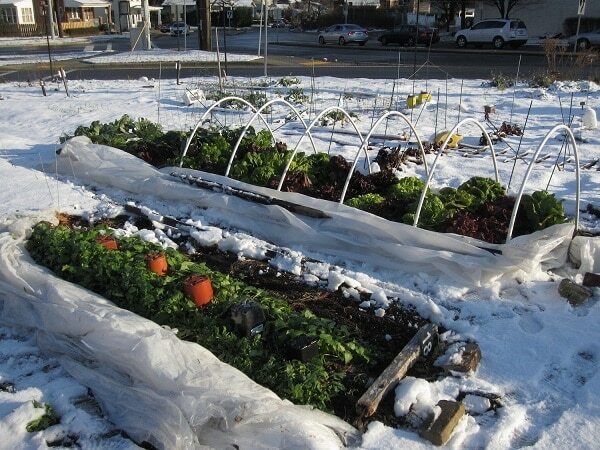 Low tunnels, high tunnels or plastic sheets over hoops make for great spaces for a winter garden outside as well. If you want to plant carrots in the cold season, you can keep them safe from low temperatures with bales of straw. This technique works like a charm for all root crops, in fact. If the weather forecast announces a big freeze, start harvesting right away. Quick-maturing vegetables like lettuce, spinach or kale are the best varieties for a successful winter crop. Also, get them growing before the first frost. 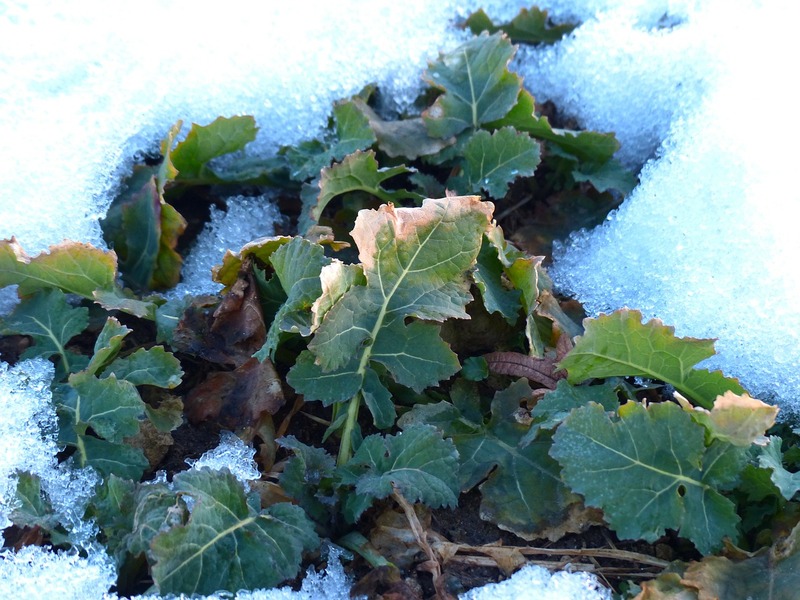 For kale, low temperatures only add a bonus in taste, for example, and it is able to withstand freezing temperatures with no problems whatsoever. Also, the more you cut spinach and kale, the more they continue to produce. When it comes to these varieties, in particular, the biggest issue is protection from the wind rather than low temperatures. If you also plant chard, make sure to mound up the soil around the base in late fall. This practice will help the plant handle the low temperatures and cold weather much better. 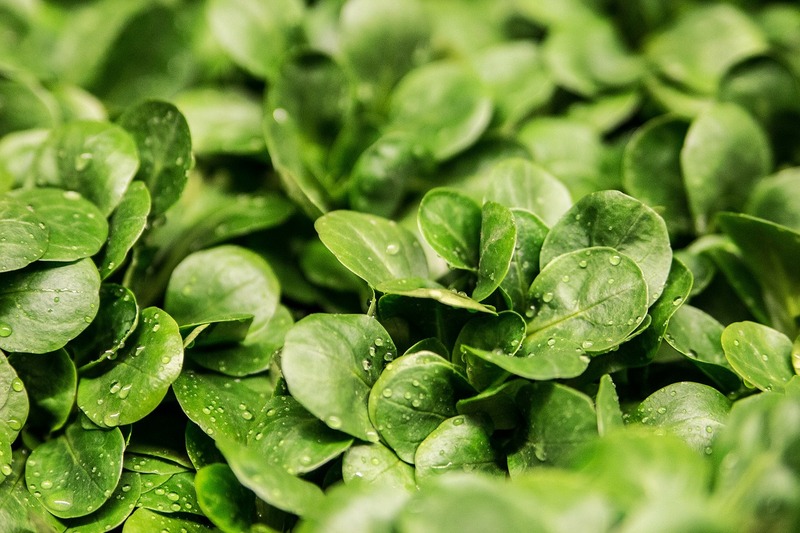 For hardy greens and lettuces, use the “cut and come again” technique to ensure a rich harvest. If you think that just because weather takes a turn for the worst during winter you will be safe from pests. Well, think again. 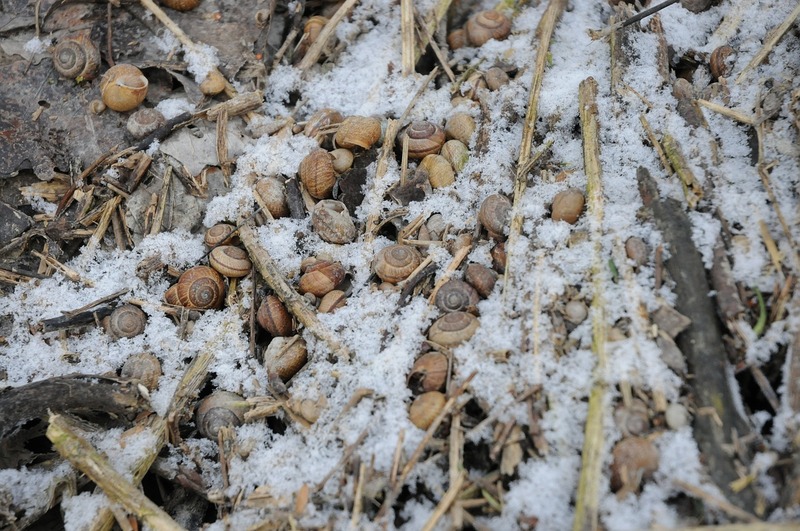 Even though not as active as in any other season, snails can have a dramatic impact on your winter harvest. You can easily get rid of them with beer or salt water. Bury a saucer or a plastic container full of beer near the base of the plant. Cover the container with a piece of plastic to keep rain out. Place it in such a way that the snails can get to it easily. After a few days, you will start to notice a dramatic decrease in population, and your plants will be safe from snail attacks during the night. When it comes to caterpillars, the only way to dispose of them without using pesticides that can prove harmful to the plants is by picking them by hand. You can usually find them under the leaves, close to the veins. You can use a natural repellent that can keep your plants safe from a wide range of pests such as snails, caterpillars, aphids, grasshoppers or stink bugs and also acts as a natural fungicide. 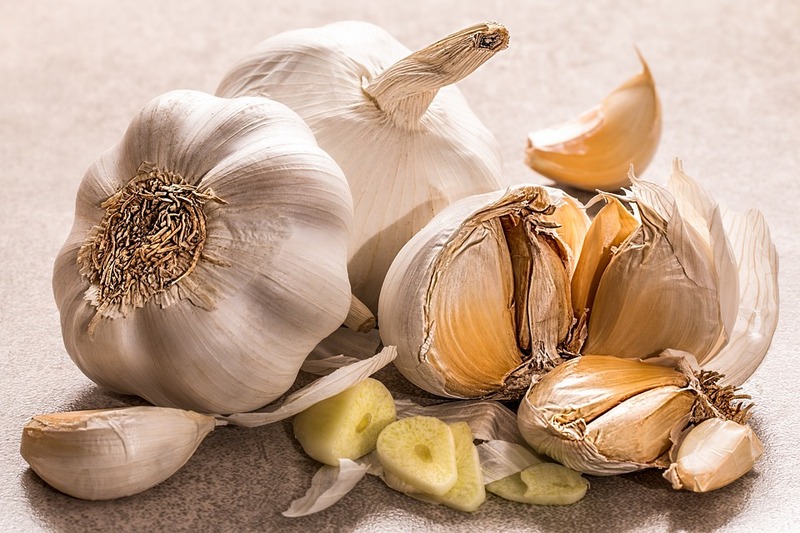 Chop about ten cloves of garlic and cover with approximately 34 ounces of water. Let it steep overnight. Next, strain the liquid and spray this mixture on the plants. You will be able to see the results right away. Even though it may sound odd, the low temperatures in winter actually work better for some varieties of vegetables. These 10 winter gardening ideas and tips will help you maintain and enjoy a rich harvest throughout the winter. Of course, there are some things you need to be especially careful of when you decide to keep your garden going through the cold season. However, the basic principles and gardening techniques still apply all the same. Just remember to care for the plants just as much as you would do in the summer. Prepare in advance for freezing temperatures, collect seeds and start building a greenhouse for the best results. Also, pay close attention to weather forecasts and prepare for heavy snow and strong winds. Ultimately, watch out for pests especially in late autumn and keep your crops safe from any attacks that may compromise the harvest. If you stick to these winter gardening ideas and tips, we guarantee that you and your family will enjoy a rich harvest and tasty fresh vegetables throughout the entire cold season.